Trixie's Travels...: Celebrate Good Times! and on Christmas Day ta boot! Priceless! The morning was quiet, peaceful...O.K. really, who am I kidding, Christmas morning and kids is not a peaceful and quiet kind of combination, but fun none the less! 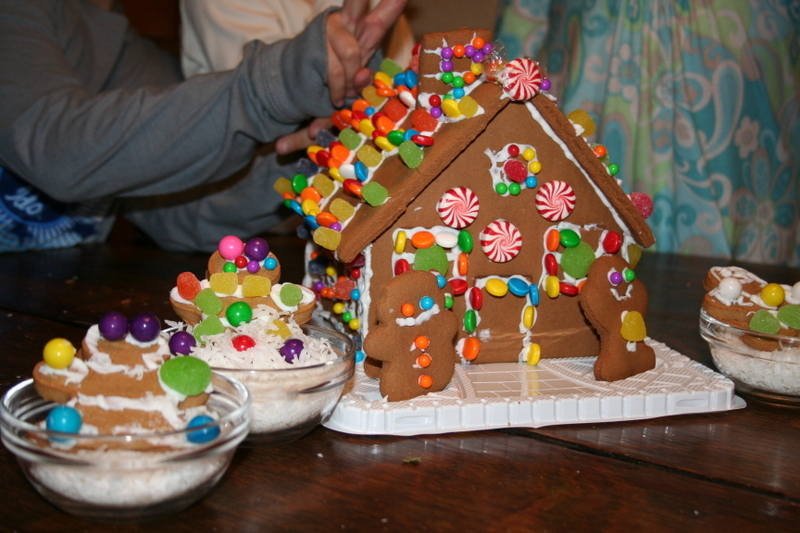 We finally made it over to my in-laws for dinner and all Mem wanted to do was make the Gingerbread House that they had gotten from my Dad as a fun precursor to Christmas. Mem is quite meticulous as to where she wants things to go even if it doesn't look aesthetically pleasing. I found it amusing how the older ones didn't want to help until they saw her in the full swing of things and then every one wanted to participate. 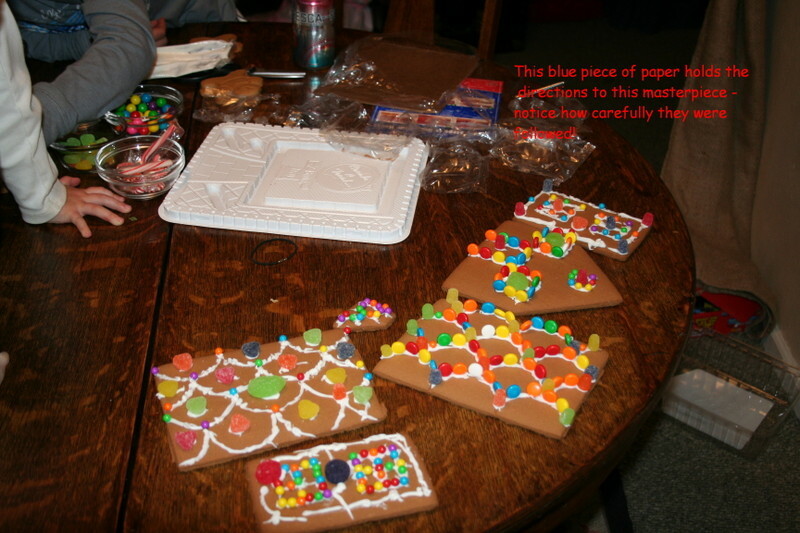 In order for this to work without some "tude" happening, we just assigned certain parts of the house to each kid and they could do whatever they wanted with that section. The funniest thing is we had just finished watching "Fabulous Cakes" from a Food Network recording that the kids had Grandma DVR for them. but with as detailed-oriented the kids can be some days - you just never know! 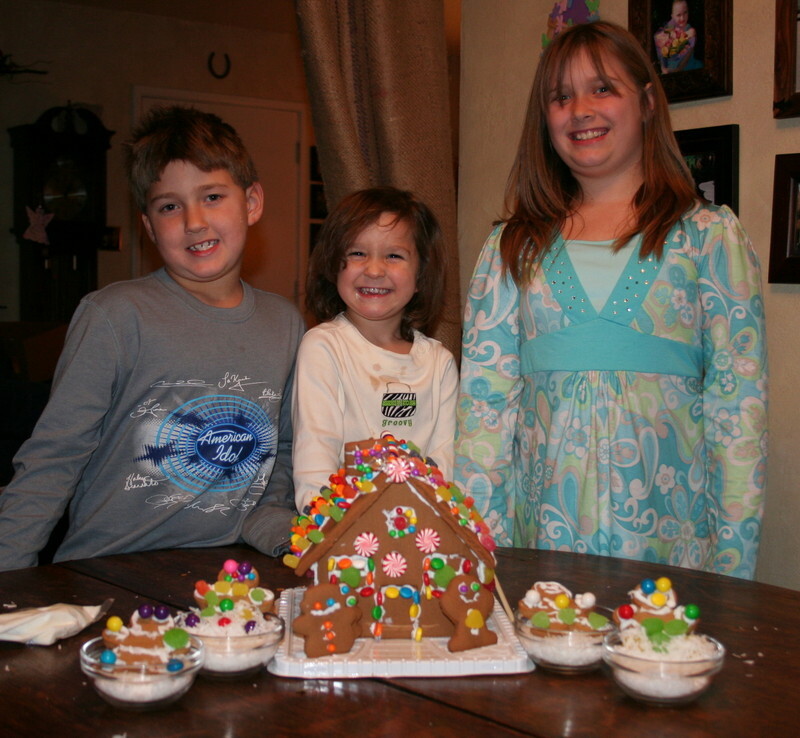 Long live the classic Gingerbread house and may the ants not attack it! Our youngest daughter is to put it mildly....she is something else in every which way. She makes us laugh and drives us insane all at the same time ~ it is a God given talent, I believe. This Christmas season we will have had one whole day that we spent the whole time together as a family. Hot Rocks job has afforded us that much. We are thankful for the job ~ don't get me wrong ~ we are truly thankful. On the day that we got to spend together, it was a previous post, there was a Santa at the outdoor mall that we were at. Mem really wanted to have her picture taken with him so she stood in line for about a half an hour....she never complained about waiting and never left the line.....when her turn was next Hot Rocks reminded us that we needed to leave or we would miss our play in SF. So Mem left, not terribly happy, but not screaming and yelling about it either - she was just moopy (and rightfully so). Now let me give you a little history about our family ~ our family consisting of Hot Rocks, myself, Sis, Pook and Mem....we are not big Santa people. We have nothing against him, but we have always celebrated Christmas as remembrance of Christ's birth. We never really got "into" Santa or I should say, we didn't encourage him in our family but we never thought of him as evil or anyone that believed in him as evil either. So this is what makes it funny for all of us here in the house - Mem LOVES Santa and it wasn't because of anything that we had done or not done. She knows why we celebrate Christmas in our family, but she really wanted a picture of her and Santa. Since our day out in Corte Madera didn't quite pan out to her expectations, Hot Rocks found out that the Bass Pro Shop had a Santa that you could take pictures with. That leads us to today ~ the day that we surprised our kids to a trip to the Bass Pro Shop to see Santa. It wasn't for the older ones, honestly, they could care less, but it was for Mem or as Hot Rocks calls her "Little One". We arrived at BPS and there wasn't a soul in line for Santa! Well, that was because he was about to take a 15 minute break....so Mem and I stood there waiting for Santa and all his helpers to get back from their break. Mem was all aglow with excitement. She stood there waiting ever so patiently. At one point, she grabbed both of my arms and shook them while saying "I KNEW THERE WAS A SANTA IN TOWN! "....the smile on her face. It was all I could do to not start cracking up with laughter. I thought to myself "What happened????". Next, she wanted to know if Santa was really off feeding the reindeer like he had told her that he was going to do. Without really thinking about it, I said "Nay, he is probably just out saying 'Hi' to all the other kids in the store". As my sister told me, that was a rain on your parade kinda statement. Mem didn't seem to mind though, she was going to finally get a picture with Santa. Well, the moment arrived and she was just plain giddy about sitting on Santa's lap. Santa asked her what she wanted for Christmas and I saw her lean over and whisper something in his ear - now mind you, this child does not like to answer questions from anyone outside of this family or inside for that matter! She came over to me with a big smile and said "Santa asked me what I wanted for Christmas and I said a POODLE!" What the heck???? Do we look like a poodle family to you? I had to laugh. That girl was as happy as a clam the rest of the day because she knew there was a Santa in town (somewhere). Have a holly jolly Christmas this year ..if I don't get back on here...we have BIG changes going on here, so time has been a little scarce for the ole' bloggy but who knows what the new year will bring! I had enough strength to get to church on Sunday and then I spent the rest of the afternoon back in bed asleep....all because of a nasty head cold that just knocked my socks of and still lingers. Hot Rocks was sweet enough to capture the always fun Easter egg hunt on camera for me to see and so that I would have something current to blog about....instead of trying to catch up on all the things that have already come and gone! finally I asked him, "What's with all the photos of the eggs? Did you think that you would forget where you had put them?" He answered a simple "Yes". A GENIUS, I tell you! Who would of ever thought of that? Certainly not I. The kids had to travel quite a distance to get to Hot Rocks parent's house. Don't they look tired from the journey? Actually, see that house across the street? The blue-grey one with bricks????... That is where we live...so you could say that we are in an easy walking distance from them! LOL! The kids had fun scurrying around the yard looking for the hard-boiled eggs. Dyeing the eggs was a "no-go" for us this year, as our hens had supplied us with "naturally" colored eggs. Who can beat that except maybe Martha Stewart? The weather was gorgeous and I got some much needed sleep. At least enough sleep to hold my head up during dinner, so that it didn't become a baked potato topping! Hope y'all had a wonderful Resurrection day and I'll chat with ya real soon! wouldn't you say? I am not talking about the kind of vacation where you have things jammed packed into a small amount of time - that kind of vacation has NEVER been vacation to me. It is the kind of vacation where you can see things and ENJOY things. The kind where you soak in the place that you are in. 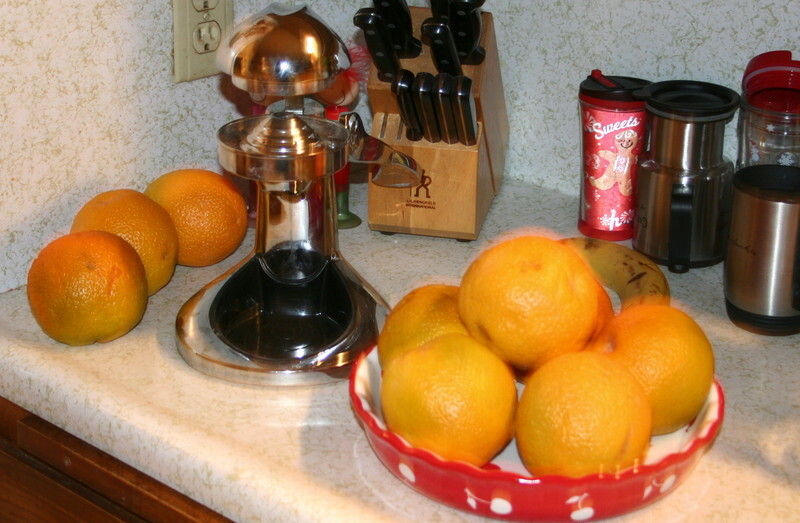 My DH comes from a "jam-packed" family, I come from the opposite. We have come to a "happy medium". We still do things and see things but we don't try to stuff as much as we can into the time that we are there. We enjoy meeting people and talking with locals - going to local favorites etc. So you ask, where is this all leading to? 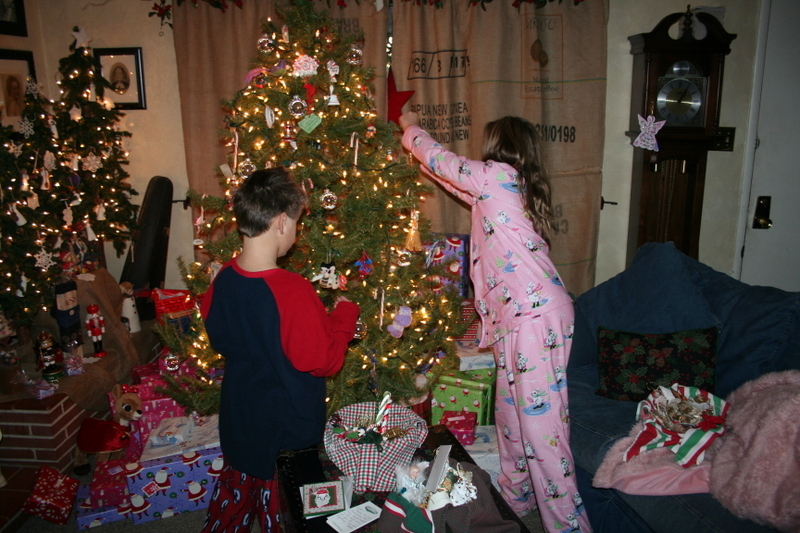 It is leading to the fact that this year, when we decided to take vacation in the middle of December we didn't come home completely exhausted and we were able to really enjoy Christmas. We listened to nothing but Christmas music on our trip, watched nothing but Christmas movies on our trip and just really treasured where we were when we were there. That is vacation AND that to me is how Christmas ought to be. We came home, finished up a little shopping but kind of resolved that we would look for a couple of things that we really wanted to get the kids AFTER Christmas. What a money saver! We were also totally blessed. You know how after vacation, funds usually run a little low... well, we hadn't gotten our "big" Christmas tree. 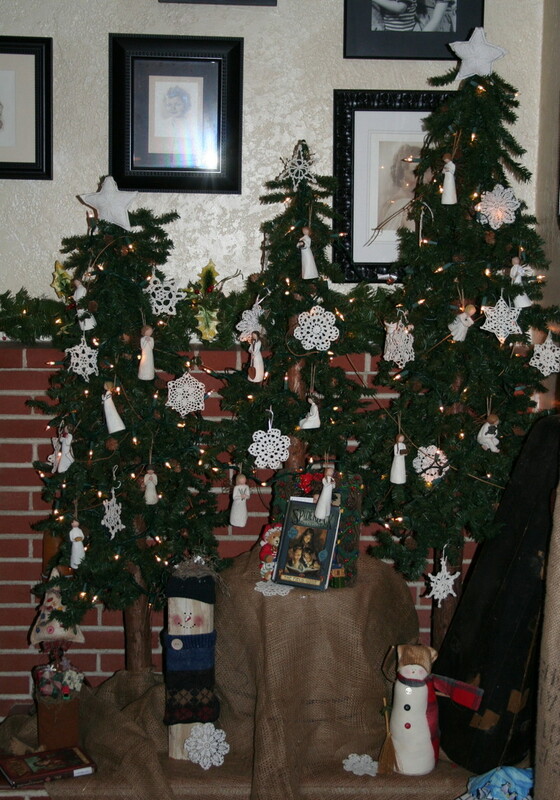 (I have a few little trees that I put around the house with different collections on them.) I didn't know if we would get one this year to be perfectly honest. I had already kind of prepped the kids for that and they were OK with it - kind of, Chase didn't really go for it, but he understood the reason. 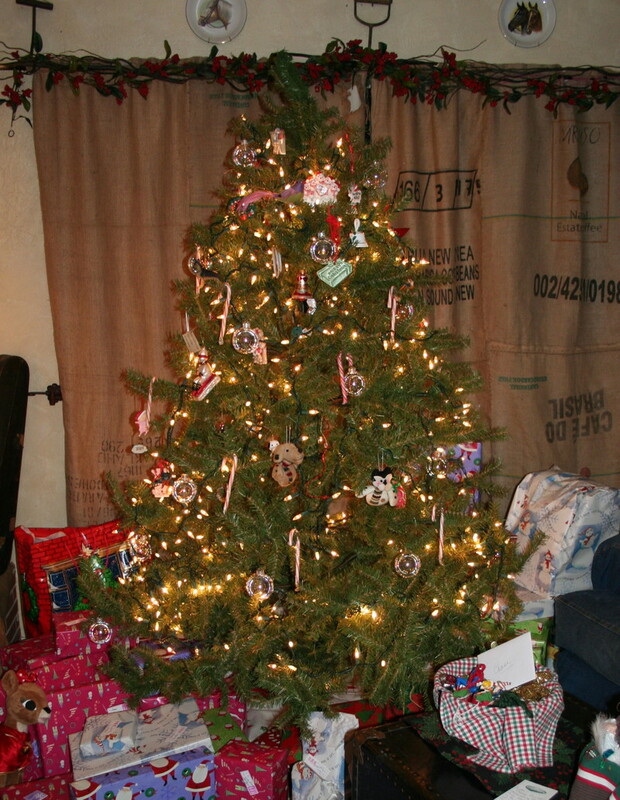 Well, on Christmas Eve we were delivering gifts to kids that had a parent locally incarcerated. We were leaving the first town that we had dropped gifts off in and on the exiting street there was a tree that was in a stand with a "FREE" sign on it. So guess what I did (I was driving as my DH only had an hour's worth of sleep), I flipped a "U-ee" and barreled down the street to go get it. The family behind us thought that I had made a wrong turn so they willingly followed along. Rob threw the tree in the back of the truck and off we went. I yelled out to the ones following us, "We need a tree for Christmas!" and we all gave a hoot of appreciation to the Lord for providing and off we went! and get things "just right". So basically, we are still celebrating the Christmas season around here. Rob & I have each done a little after Christmas shopping, coming home with little treasures for everyone. It has been a fun time this year though we are missing Toti. Toti is still stuck in Las Vegas with the doctors doing what they can to get her heart rate to maintain a normal heart rate. It is either to low or racing. The doctors are trying to stabilize her so that she can go home and when she does get home that will bring changes to our house. We will be very limited in the things that we will be doing as we are going up periodically to help take care of her. Keep her in her prayers. As the New Year approaches, may you be blessed with His loving kindness, family surrounding you and good friends beside you! I am so looking forward to this coming year and all that it holds - thank you so much to all of you that have read my "on-line" journal. Mucho blessings and love! Would anyone like to build a house? 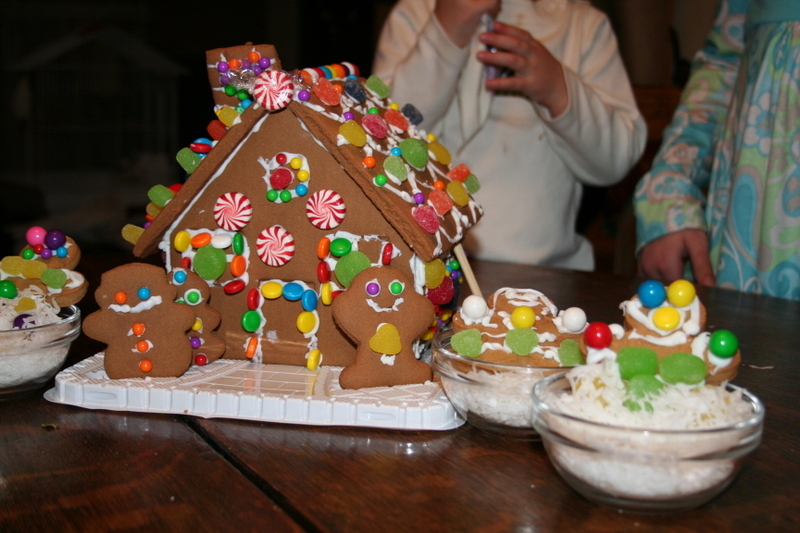 a gingerbread house that is! 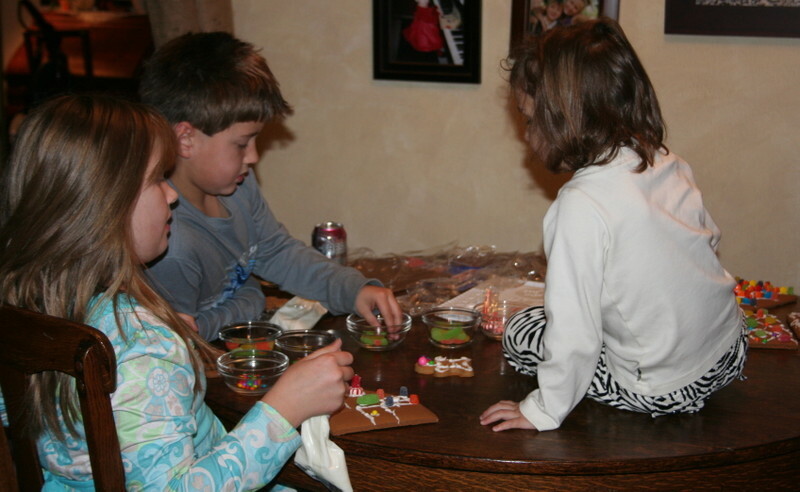 Tonight was the night to build the Gingerbread House and the kids were into it. I think it was more the end result of being able to eat it they kept them so motivated! There is NEVER a dull moment around here as you can see. 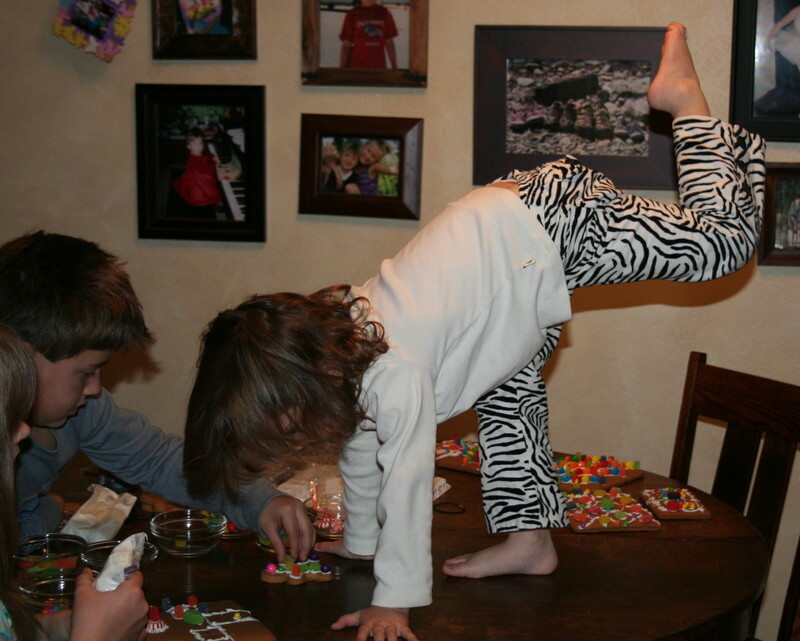 The littlest one needed to show how well she can assemble her gingerbread man and do a beautiful dance at the same time! Look at how high she can lift her leg and still concentrate on her project! Here is a close up - how do you like the gingerbread men relaxing in a bowl of coconut flakes??? Pretty creative kids! The last shot for the evening! Have a wonderful Christmas Eve and we'll chat soon! You could hear a pin drop here - ahhhh, peaceful. The little white lights illuminate the pine trees around the fireplace area. 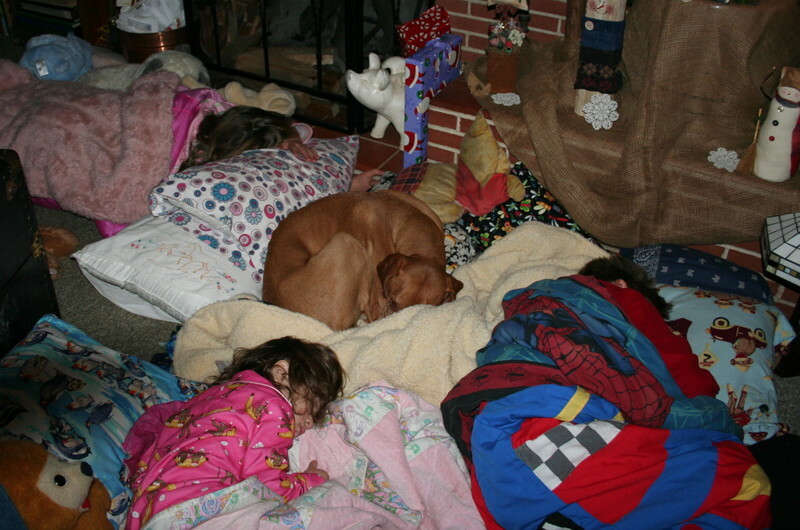 The kids are all nestled snug in their sleeping bags in the front room. The dog is eating, barking and moving around more and the Great Toti is recovering! Thank you all for your prayers. Duke is still not drinking water and his saline bag under his skin has pretty much depleted. He has regained his appetite and he has until noon on Christmas Eve to start drinking water or he is getting another bag! The greater news is that Toti called this morning. Makayla had spoken with her on the phone the night before and just broke down crying because she thought she was going to lose her - though we all know that she would be with our precious Jesus if she did pass, we all adore her and we would miss her. The antibiotics kicked in and she is not gasping for breath. She talked with everyone for a few minutes this morning and we were all very thankful to hear her voice. She still has a ways to go, so please keep praying for her continued healing. 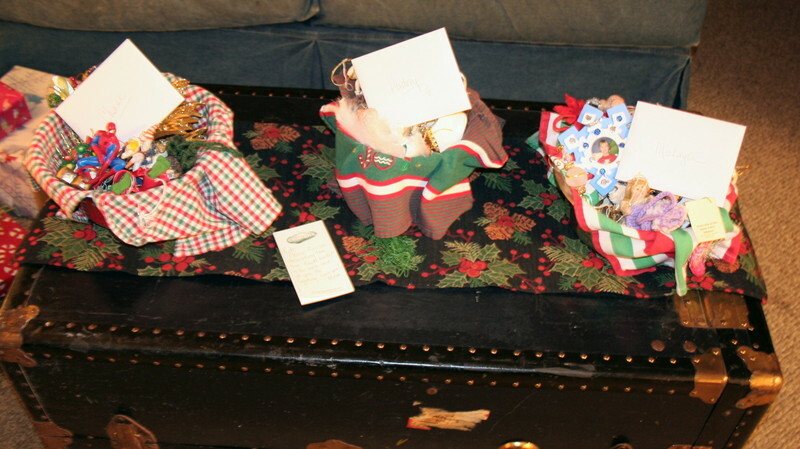 On the flip side of life, I am putting together a little somethin' for my DH. I had a subscription, if you want to call it that, to Club Scrap a while ago. In one of the pizza boxes, they sent this cool project. It is a ..(shhh, it's a secret!).............. and I have wanted for a year to make a special little diddy for him with pixs and memory stuff from an anniversary trip that we took last year. It was seriously the best anniversary we have had since we have been married! But....I can't show you just yet because my DH sometimes pops in to the ole' blog action. 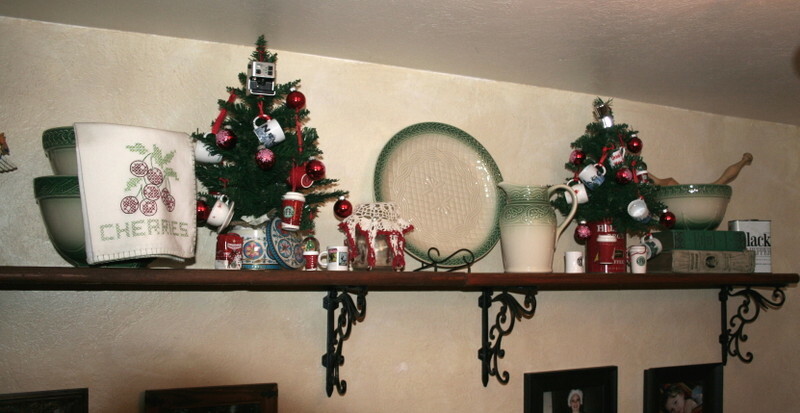 an assortment of Starbucks ornaments that I have collected over the years. Also 3 of the 9 pine trees that I put up. These are by the fireplace and have my collection of Willow Tree ornaments on them. 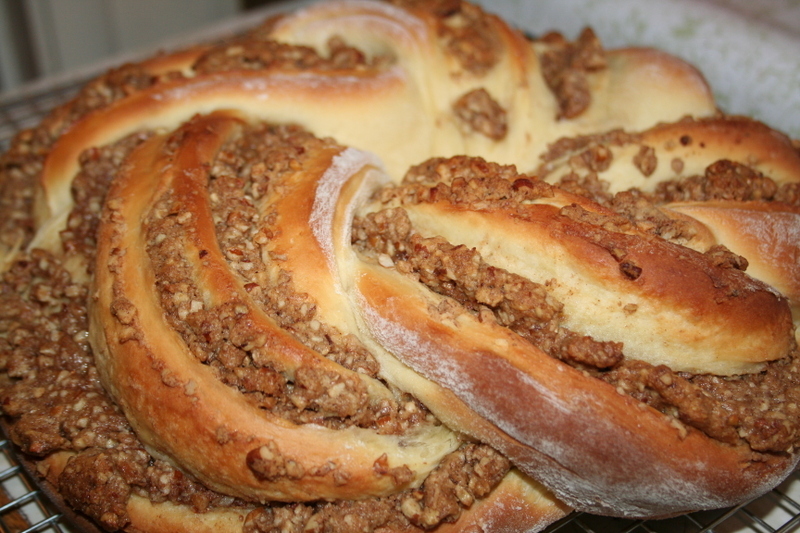 Hopefully, I will have some lovely Pecan Twists to show to you tomorrow and a half-eaten Gingerbread House that the kids are suppose to put together! The kit says that there is a pound of candy in it - well ...there will be about 3/4 of it in the tummies of 3 kiddos - I can guarantee. Happy Trails and see you at the next watering hole. Why not create your own holiday? It's Easter time again and as a family we love to remember all that Jesus did for us on the cross and that He rose again to give us a new and eternal life. We are able to spend the day with our family and just relax and enjoy. We haven't ever really made a big deal about the commercial side of Easter and last year my hubby wanted to be able to get together with people and really be able to enjoy this time of year as a whole. He named it Passtivist - (Passover for the rest of us). It isn't meant to slight anyone at all - but as a Christian to see how God had used the Passover as a shadow of what Christ would do for anyone who would receive Christ as their Lord and Savior. 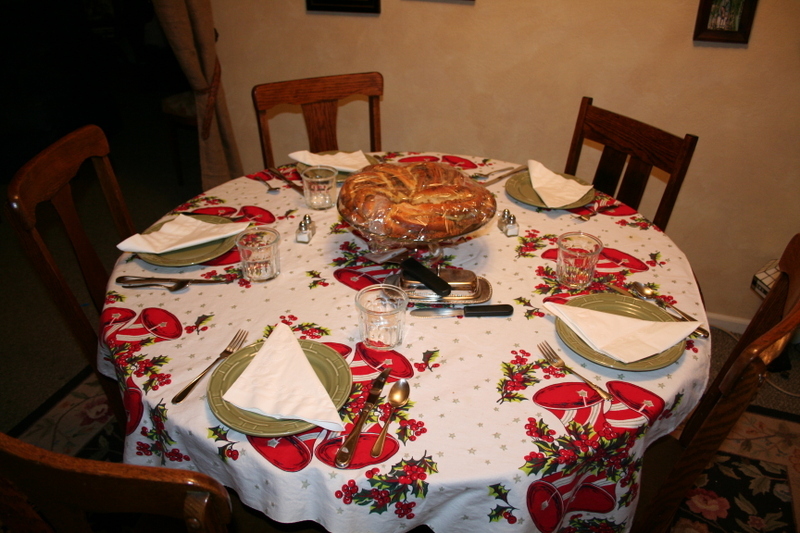 Last year was really intimate with our family, Rob's parents and grandmother, my brother and a family of close friends. As Rob was finishing up the teaching, more people started to roll in at about 3-4p.m... So we started the next round of food. There were 3 #'s of asparagus that were thrown on the BBQ, 2 #'s of baby artichokes cooked up and a couple of delicious salads were brought! Who can forget dessert though? There was a Red Velvet Cake, Cheesecake, and 2 Nation's pies! We busted those out - ate a little more and listened to Jarrod share about what Christ had done for us through the New Testament Scriptures. People left but more people came later in the evening! We were able to sing worship songs and take communion with each other and have more dessert! Brownies! 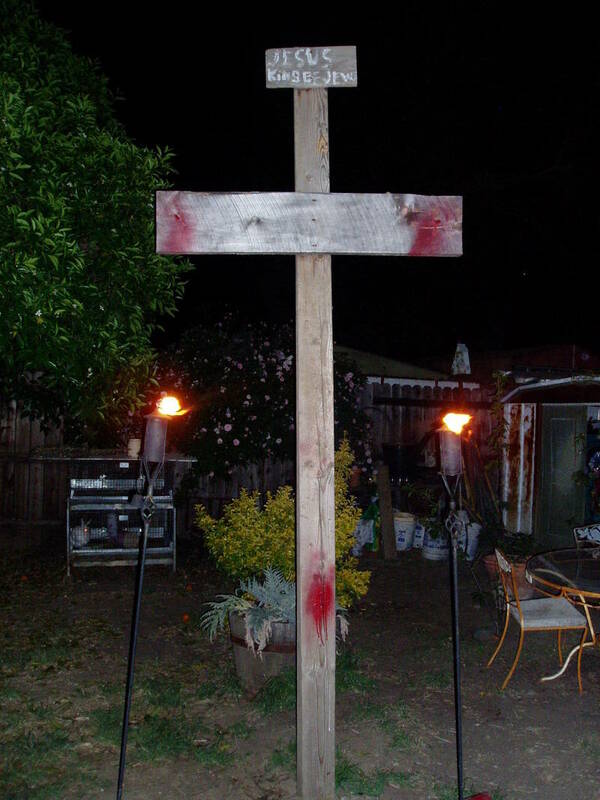 The kids were huddled around a camp fire, wrapped in blankets, sitting under the Cross that had been made the year before. It was a precious sight to see, knowing that Jesus asks us to come to Him as little children. We can sit at the foot of the Cross and see all that Christ has done for us and smile because there isn't anything that we have done or will do that can earn the kind of love that He has for us and wants to pour out upon us. Have a wonderful Easter day and may you feel the presence of God's love surrounding you today and everyday! Shalom!